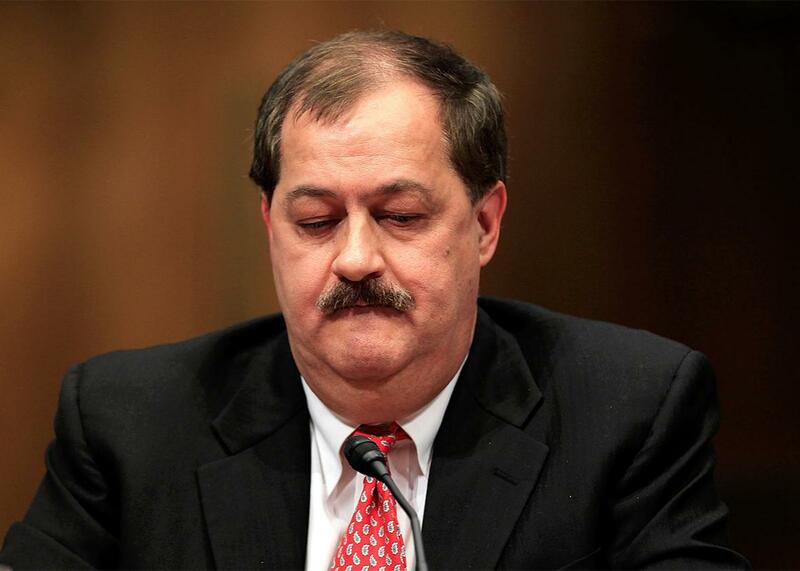 Don Blankenship trial: Boss of Massey during Upper Big Branch explosion ignored safety. One of the most reprehensible bosses in recent history is finally facing justice. Former chairman and CEO of Massey Energy Company Don Blankenship, here pictured testifying before a Senate committee, May 20, 2010, in Washington, D.C.
At 9 a.m. on Oct. 1, former coal baron Donald Leon Blankenship will stand before a judge at the Robert C. Byrd U.S. Courthouse in Charleston, West Virginia, for what promises to be a lengthy, complex, and historic criminal trial. The tall, jowly man was chief executive of the now-defunct Massey Energy Company for a decade. He will be brought to justice for allegedly shunning coal mine safety rules, conspiring to conceal safety violations, and lying to the U.S. Securities and Exchange Commission and company shareholders. He faces 30 years in prison if convicted. Known for his in-your-face policies and politics, Blankenship is accused of creating a ruthless work culture that skimped on safety and employee well-being to improve the bottom line. Three investigators have concluded that his methods contributed to the explosion at the company’s Upper Big Branch deep mine at Montcoal, West Virginia, that killed 29 miners on April 5, 2010. It was the worst mine disaster in 40 years in this country. The trial, expected to take at least a month, will go far beyond the four criminal indictments. It represents both a beginning and an end for the Central Appalachian coalfields of West Virginia, Kentucky, and Virginia that have seen plenty of blood, pain, and exploitation. In a sour endgame, the trial also reveals the predicament left by the slow death of the coal industry. Billions of dollars worth of wealth have been hauled away in coal train cars, leaving a badly impoverished region short of funds for human needs or the repair of decades of ecological destruction. While running Massey Energy, Blankenship relished in confrontation, whether it was in numerous lawsuits he filed, the union locals he busted, or the environmentalists he lambasted. He demonstrated his propensity for the outrageous when he dressed up in an American flag costume for an anti-labor-union festival he paid for on Labor Day 2009. His entertainment included such politically reactionary celebrities as Hank Williams Jr., Ted Nugent, and Sean Hannity. His behavior as an accused criminal has been just as polarizing. His lawyers have won three delays, claiming that Blankenship is so despised by local residents and maligned in the news media that the trial should be moved far from the coalfields to Martinsburg, in West Virginia’s eastern panhandle, or Baltimore. They have impugned the integrity of U.S. Attorney Booth Goodwin, the lead prosecutor in the case, who comes from a politically prominent Democratic family and was appointed by President Barack Obama six weeks after the Upper Big Branch disaster. Blankenship has contributed heavily to Republican causes. The biggest legal tussles so far have involved another coal company, Alpha Natural Resources, a onetime bitter Massey competitor that bought the much-weakened firm for $7.1 billion in 2011. Based in Bristol, Virginia, Alpha had long coveted Massey’s treasure trove of metallurgical coal, which is mostly exported to make steel. All of the coal produced at Upper Big Branch was of this type. At the time of the disaster, global demand for it had been so insatiable that Norfolk Southern railroad was running short of thousands of locomotives and hopper cars to haul metallurgical coal away for export. Alpha absorbed most of Massey’s workforce and tried to retrain the new employees in safety practices using a program called “Running Right.” Blankenship vanished into obscurity in Tennessee and Las Vegas, with a severance package valued at $86 million. He reappeared a couple of years later with a gauchely patriotic Web site. He released a self-made “documentary” saying that the Upper Big Branch disaster was an “act of God” caused when miners struck a hidden natural gas pocket and not the result of defective equipment and procedures, as investigators have found. He seemed to be positioning himself for a political comeback that would take advantage of the shift of disaffected West Virginia voters from blue to red. The bill for such pricey legal talent is running to $10 million, according to some lawyers. Alpha is refusing to pay, even though its agreement to take over Massey included indemnifying Blankenship. Ever litigious, Blankenship sued Alpha in a Delaware court this spring, saying the company had signed documents agreeing to pay his legal bills. Blankenship won, but there’s a dilemma. This summer, Alpha filed for bankruptcy due to price drops for utility coal caused by an abundance of cheap natural gas. The price of Alpha’s valuable metallurgical coal has dropped 70 percent from its high of $330 per metric ton four years ago due to a global economic slowdown, particularly in China. A bankruptcy judge might not allow Alpha to foot Blankenship’s legal bills. In another twist, Alpha coughed up what it found during its own internal security investigation—thousands of hours of tape recordings made, Richard Nixon–style, by Blankenship. The existence of the tapes, handed over by Alpha to prosecutors in a plea deal, came out during sparring over legal bills in Delaware. The tapes will be a wild card during the trial, says Bruce Stanley, a Pittsburgh lawyer from the same West Virginia county as Blankenship who has tangled with him in court many times. Stanley says he had wished he had known of the tapes during previous lawsuits against Blankenship but doesn’t know how important they will be as evidence. “There can be selective taping. He can hit the ‘on’ switch when, in his mind, it’s to his advantage,” Stanley says. Jury selection should begin this Friday and may take several days. The prosecution is expected to lay out its case in a plodding, step-by-step manner that will produce thousands of pages of documents from the U.S. Mine Safety and Health Administration. They are expected to show Massey’s overwhelming number of safety violations and Blankenship’s refusal to take corrective action. Another revelation will be that Massey managers had a method for warning miners covertly when MSHA regulators were making supposedly surprise inspections, which gave the miners time to cover up any security violations. Four Massey managers have been convicted previously of crimes relating to the Upper Big Branch explosion and other events. There are rumors of a surprise prosecution witness. Some say it might be Chris Blanchard, a top executive and Blankenship lieutenant who suspiciously raced into the Upper Big Branch mine with no protective gear just after the blast. Testimony in the investigations indicated that Blanchard may have changed something at the scene before inspectors could arrive. The defense is prepared to counter masses of government paperwork with rafts of its own. A big question is whether Blankenship will take the stand. In previous trials and government hearings, he has come across as so defensively terse that he has to be asked many times about basic facts, such as how many miners had been killed when he was chief executive. He admitted that 52 had perished. He is also supremely confident, and that means his testimony could be a double-edged blade. “When I’ve gone up against Don Blankenship, I’ve always gone up with the idea that his best friend is his own mouth. There’s a good chance that he’ll say things that he thinks are good for him, but you have to see those things through the ‘Don’ lens,” says Stanley. The MSHA’s own reputation is also at risk during this trial, notes McGinley. The regulatory agency had cited Massey hundreds of times but never succeeded in stemming the conditions that led to the Upper Big Branch disaster. “Where was MSHA?” he says. Lawyers expect the trial to last a month or more, but it will take a lot longer than that for the people left behind by Blankenship and other coal company owners to recover. As is typical, ordinary mountain folk are bearing the burden of the bad times. Since 2009, some 26 coal companies, including Alpha, have gone bankrupt and shed thousands of jobs. Patriot Coal, spun off from Peabody Energy, the nation’s No. 1 coal producer, is accused of seeking court protection to cheat miners out of their pensions. Another leftover from the coal boom years is the environmental destruction from “mountaintop removal” surface mining, in which thousands of acres of mountaintops were sheared off to get at thin coal seams. Derelict coal firms might not have the money to clean up their messes. Companies typically post cash bonds or use their healthy balance sheets as collateral for surface mine cleanup. Alpha, for example, chose the latter to reclaim surface mines in the rolling Powder River Basin of Wyoming. But with Alpha’s ledgers in tatters, Wyoming regulators have informed Alpha they might require hundreds of millions of dollars in cash that the firm doesn’t have. How they will reclaim the technically more difficult topography of the Appalachians isn’t known. “This stuff is happening a lot faster than it takes for new opportunities to be created. There have been thousands of layoffs,” says Rory McIlmoil, energy policy director of Appalachian Voices, an advocacy group based in Boone, North Carolina. Regional leaders have been warned for years to diversify their economic base but haven’t done much, he says. One boost, he adds, could come from Obama’s “Power Plus” plan that would provide an extra $1 billion to help turn abandoned mines into economic projects. But it has to be passed by Congress. Blankenship’s trial won’t do anything to resolve the disasters the coal industry has left. His conviction might bring closure to the families of the dead miners. But in the long term, it might end up being a mere footnote in the tortured history of the Appalachian coalfields.